Ladder delivers development and mentoring programs supporting young people to unleash their talents and build a future free of homelessness and full of possibilities. Ladder was established by a group of AFL players in 2007 in a bid to empower young people to break the cycle of homelessness. Ladder is the Official Charity of AFL Players and a national partner of the AFL. 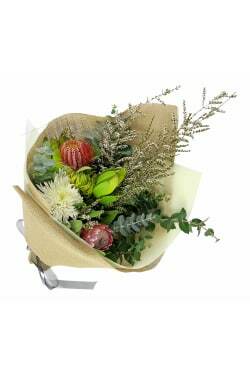 Support Ladder by purchasing our first impression bouquet which contains a mix of australian wildflowers. For over 10 years, Ladder’s programs have enabled young people to take control of their lives, transition to independence and achieve their full potential. Our approach to working with young people is to focus on their strengths and what they can achieve, moving away from the cycle of disadvantage and negativity they may have experienced in their lives.